The 2nd Annual “Dog Days” event will be held on Saturday, July 28nd, 2018. The event is a dog-friendly event. There will be 5K awards for overall male, female and canine; top two finishers in each age category (male and female) 12 and younger, 13-19, 20-29, 30-39, 40-49, 50-59 and 60 and older. 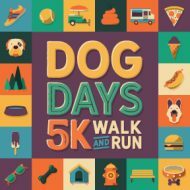 Participants can choose to walk the 1-mile loop with their dog or, if they are looking for more of a challenge, they can choose to run or walk the 5K event. The 5K will be a chip timed event provided by Falcon Race Timing. The 1 mile walk is for fun and will not be timed. There will be water stations for walkers/runners and dogs along the course, food and beverage for registrants, raffles, FREE photo booth, music and much more! Participants who register by 11:59 PM on 6/30/18 will be guaranteed a shirt with their paid registration. Online registration will close July 23, 2018 at 11:59 pm. We will have registration the morning of the race/walk beginning at 7am. 100% of the proceeds from the event will benefit the Unleashed Foundation, which is a non-profit organization providing education on responsible pet ownership as well as financial assistance for necessary medical care to pets whose owners cannot afford veterinary care when the alternative is often needless suffering, surrender or euthanasia. Last year we raised over $20,000!